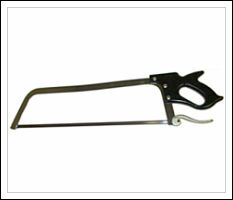 In this method of dehorning, a hand saw is used to remove the horn along with a ½-inch ring of skin around the horn base. Advantages: Can be used in older calves with large horns. Disadvantages: Risk of infection and death from blood loss; may lead to set-backs in overall health and performance, including weight loss; animal must be monitored for several days afterward.